This is Quetzal, all is well. We'll be in touch when we can. Hello from the marina in Kusadasi. Yes, we have finally left Greece behind for Turkey after a full week of sailing. We arrived this afternoon after motoring over from Pythagoria on Samos, where we moored last night. Today was our best weather day so far, sunny and warm, but with almost no wind, thus the motoring. Kusadasi has a different, much less European feel from any of our Greek landfalls. Turkey is a Muslim country and it shows in the cleanliness of its streets, the friendly nature of its people and the liveliness of its marketplaces. 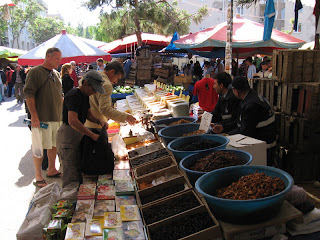 We spent the afternoon wandering around the area near the marina, buying spices and produce to boost our diminished provisions. We ate dinner at Mezget, a traditional Turkish restaurant with excellent seafood and grilled meats. The last prayer of the day just echoed out across the city about a half-hour ago, so it must be time to call it a night. Tomorrow we are taking a tour of Ephesus, the famous Roman ruins north of here. It will have to substitute for Troy, which is still too far away. On Thursday, we are planning on getting underway early and sailing continuously until we reach the northwest corner of Crete, about 120 nautical miles away. This will involve overnight sailing and two-person, three-hour watches. Sorry again about the SPOT updates. Apparently, all of Nan's and my email addresses have been left out of the recipients list. The update from yesterday was forwarded to me by crewmate Kevin. It shows us on our way from Kirikos to Pythagoria. Capt. John says he will try to get the situation rectified by tomorrow. I will keep you posted. Not where you (or we) expected. The winds have been blowing hard out of the north so we have been unable to make much comfortable headway in that direction. Instead we have been heading east. So from Mykonos, where we spent last night, today we sailed further east and are now in Kirikos on the island of Ikaria, named after Icarus, the character from mythology who flew too close to the sun, melted the wax that held his wings together and fell into the sea. I picked up a wireless connection from the harbor because the Internet cafes are closed. Today is Easter in the Greek Orthodox religion, and we just witnessed the local people hanging and burning Judas in effigy. They take Easter very seriously here. Tomorrow we hope to clear out of Greece in Samos, the next island to the east and then clear in to Turkey in Kusadasi. We will be too far south of Troy to even attempt an overland journey to the ruins, which would probably be about twelve hours by car or bus, so we may go to one of Turkey's more famous sites, Ephesus. By the way, the GPS satellite coverage in this area is weak, so we have been unable to send the SPOT beacon messages or to even secure our latitude and longitude using the GPS at times. We hope this will improve later in the voyage as we move toward Crete and Ithaca. Greetings from Gavrio, on the island of Andros, about sixty miles east of Athens. We are pinned down here by a Force 7 to 8 gale that is blowing out of the north. We arrived here late yesterday afternoon on our way toward Turkey and have been here now about twenty-four hours. This morning we were thinking of heading southeast to Mykonos to avoid beating ourselves up fighting into the wind, but with gusts of close to fifty miles per hour, Capt. John decided we should stay put for the day. I'm sorry about the SPOT beacon broadcasts. Capt. John put me in charge of them a couple of days ago and I have sent out two so far but they're not going anywhere. I will review the instructions with him and try again tomorrow. Of the two you missed, the first was from Cape Sounion, within sight of the Temple of Poseidon. I took some great late afternoon shots of the temple, but I am at an Internet cafe and will have to post them later. The second was from Gavrio, where we are now. If the weather improves, we will probably head north tomorrow through the Doro Channel and then northeast to the island of Lesbos, where we will check out of Greece and check into Turkey, with landfall at Ayvalik on Sunday sometime. Everyone here in Greece is getting set for Easter, one of their biggest holidays. They start celebrating at midnight on Saturday and continue for three weeks. The locals are telling us we should stick around for it but we're anxious to press on if we can. We're barely three days into our Odyssey and we haven't even made it to Troy yet. On Tuesday morning, Nan and I caught some breakfast at an Everest Cafe ("It's cool!") and then took a taxi down to the Acropolis. We had hoped to meet Harry and Velinda there, but they were running behind due to electrical problems at the boat. Capt. John thought there was a problem with the alternator so they were going to go find a new one. When we arrived at the entrance to the Acropolis, we were surprised to see thousands of people already there and trudging up the steep walkway to the top. 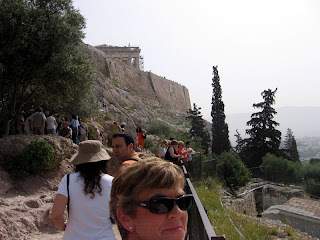 Here's a photo of Nan on the walk with the Parthenon on the hill in the background. 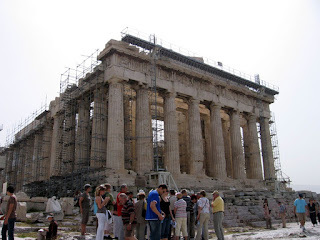 The Parthenon itself is an amazing architectural achievement considering that is about twenty-five centuries old. Its scale is based on the squares of the first three numbers, so it is four units tall and nine units wide, and the columns are nine units tall and four units between. To fool the eye and its tendency to curve perspectives, the base is curved slightly upward in the middle so that it appears to be a straight line when looked at straight on. In the same way, the columns bulge in their middles and tilt slightly inward to achieve the same effect. The entire area is in a condition of continuous renovation, so there are cranes and scaffolds everywhere. We're not sure if maybe they intend to put the Parthenon back into its original condition, which was badly damaged by the invading Venetians in 1687 as well as the ravages of time. 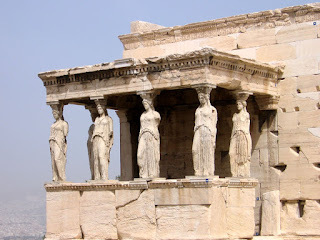 The caryatids are well preserved and represent, I think, the oldest use of statues as support columns. They are smaller than I would have thought, maybe ten feet tall. Behind them but not visible is an olive tree planted in the location where Athena herself is supposed to have planted an original one. 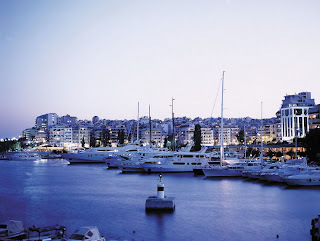 In the evening, we took a taxi down to the Marina Zea in Piraeus to meet up with Capt. John, Harry and Velinda, and Kevin. We did a quick chart briefing and some last-minute provisioning and then went to dinner at a local taverna featuring, what else, authentic Greek food. We are on our way down there again this morning to cast off on our sailing adventure. We expect to pass the Temple of Poseidon on our way to a marina around the corner from Cape Sounion before heading across the Aegean for Turkey tomorrow. We arrived today at about 1:30 PM local time. That post from yesterday was sent by Capt. John from the SPOT beacon on Quetzal, which is parked in a slip at Marina Zea in Piraeus, southwest of downtown Athens. The link to Google Maps pinpoints her exact location. Our taxi ride from the airport to the hotel turned into a driving tour of the must-see sights as our cabbie proudly showed off his hometown. 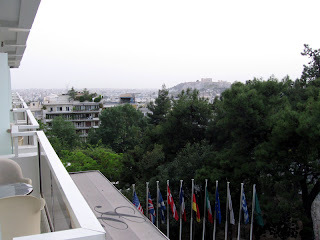 These included the stadium from the 2004 Olympics; the United States embassy; the guards in their traditional skirted uniforms standing guard at the Parliament building; Athens' first grand hotel, the Grande Bretagne; and numerous hospitals, each tailored to a different income level. The travel came off without a hitch until we tried to check in at the St. George Lycabettus hotel. They didn't have any record of the reservation Nan made more than two months ago. We almost went into jet-lag comas in the lobby waiting for them to straighten it out, which ultimately took a direct phone call from Nan to American Express. Sometimes you have to play the final card. After settling into our room at around 3:00 PM, we touched base with Capt. John, who is carrying a Greek cell phone for this trip. He said that Harry and Velinda had arrived yesterday and were staying on the boat. Kevin had arrived the same day, but he was staying at a hotel and bombing around Athens on his own. And here we thought we would be the first arrivals. Instead of heading straight to bed, which would have had us waking up ridiculously early tomorrow, Nan and I regrouped and went for a long walk in the Kolonaki and Plaka neighborhoods between our hotel and the Acropolis. 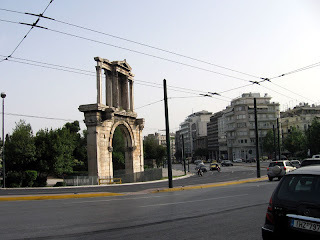 Along the way, I snapped some photos including the one above of Hadrian's Arch, which is unfortunately located right next to Syngrou Av., a major thoroughfare. We passed a good cafe, La Pasteria, on the way out and didn't find anything better on the way back, so we ate pasta and drank Greek wine until we were ready to call it a night by 7:00. Harry and Velinda want to tour the Acropolis tomorrow, so we'll try to meet up with them in the morning. We have a decent view of it and the Parthenon from our hotel balcony. The photo would be better if there weren't so much mist in the air, but it is warm and humid this close to the Mediterranean. Tomorrow morning we depart for our long-awaited Odyssey trip. We will arrive in Athens on Monday afternoon and maybe do a little sightseeing if we're not too jet lagged. Our hotel is within walking distance of the Acropolis, so that would be our first stop. On Tuesday morning, we'll try to meet up with Capt. 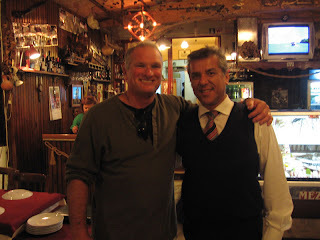 John Kretschmer at Marina Zea in Piraeus to help with any last-minute provisioning. Quetzal, his 47-foot Kaufman cutter-rigged sailboat, is parked in a slip there. (The photo is from the marina's website at medmarinas.com. Click it for a larger view.) Nan has never met John, so introductions over breakfast and a quick tour of the boat may be in order. The rest of the crew--Harry, Velinda and Kevin--should arrive by Wednesday, when we're scheduled to set sail. My guess is that we will sail overnight to Turkey that first day. The weather and other factors could dictate otherwise, but right now the extended forecast is calling for sunny skies and average temperatures around 70 degrees. Windfinder.com is showing light breezes mostly out of the north in the Aegean Sea which separates Greece from Turkey, so we could be in for some perfect sailing conditions as we set out. It has been a week now since Charlie died and I am more depressed than I have been since adolescence. At moments I feel like I am teetering on the edge of the abyss, that if I'm not careful, I will give myself over entirely to despair. I have experienced the grief of losing people close to me before, but losing a pet who was such a close friend and companion for so many years has exposed me to grief of a new magnitude. It is grief mixed with guilt and helplessness. People who are dying slowly from disease or at the end of a long life can communicate with words what they are going through. Dogs can't. They trust us to read their moods and expressions. There were times when I was sure Charlie was pleading with me, "Why aren't you helping me? Why aren't you making me better?" I could only look into his eyes with sorrow, feeling the guilt that I was somehow responsible for his cancer and the helplessness of knowing that it didn't matter what we did, his cancer was going to kill him. I'm sure he was thinking, "You fixed my knee when I injured it. Why can't you fix this?" He might as well have been praying to an indifferent God for all it would matter. People who saw Charlie and me together would sometimes ask what I did to end up with such a good dog. I would tell them that we had formed a strong positive bond when he was just nine weeks old. It was based on praising the good behavior rather than punishing the bad. After a while, Charlie lived for that praise. He aimed to please. If I reprimanded him, he was devastated, sometimes sulking for hours under the furniture until he worked up the nerve to approach me and lick my hand in penance. The reassuring pat on the head would set his world back to rights every time. The cancer violated our trust. Charlie received three months of continuous punishment without having done anything to deserve it. How could he be expected to understand? How could I expect him to forgive me? Charlie passed away on Sunday evening. He and I were walking our regular late afternoon loop out to the playground near our house, and on the way back he started bleeding from the mouth and getting frantic from the pain. Nan and I rushed him to the emergency pet clinic and they were able to stop the bleeding, but we agreed that it was time to end his suffering. We sat on the floor with him as they gave him an injection that put him to sleep and stopped his heart. Reflecting on the day, it was as if Charlie sensed his time was coming to an end. He did everything he always did, from licking my elbow to wake me up in the morning to napping at my feet while I watched the afternoon Avalanche hockey game, but there was a noticeable distance to him. You can see it in the photo, which Nan took as we were working in the yard earlier in the day. He's not looking at Nan, he's looking somewhere else. You can also see how dramatically the tumor inside his mouth is swelling the left side of his face. Even though he was mine, Charlie was still the best dog I have ever known. We formed a bond of love and friendship when he was just a few weeks old that lasted all of his ten years. I know it allowed him to be the smart, affectionate and well-behaved dog he became, and I know it made me a better person. 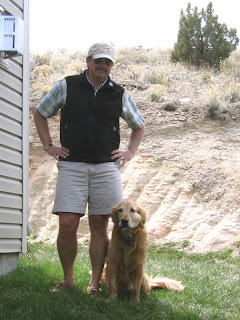 To honor Charlie's memory, I am writing a book about everything we did right with his upbringing so that others might experience the same rewarding dog and owner relationship. It will be titled Raising Charlie: The Lessons of a Perfect Dog. A couple of months ago, NPR's Talk of the Nation featured psychologist Steven Pinker discussing the evolutionary roots of morality with host Neal Conan (Steven Pinker on Morality as a 'Sixth Sense'). About ten minutes into their talk, Dr. Pinker mentioned a bumper sticker I have also seen: "If you're against abortion, then don't have one." As a person who supports abortion rights, I have thought this made good sense, but Dr. Pinker argued that it misses the point: "If abortion is a moral issue to anyone, then just agreeing not to do it yourself is not an option.... The very fact that it's considered moral by some people means that, necessarily, it has to apply to everyone." I had always thought of morality as a set of principles shared by a common group of people for their mutual benefit. For example, it is wrong to steal, or it is right to give to charity. These are black-and-white examples, but what about the many gray areas? At what point does a practical matter become a moral issue, or vice versa? Meat is considered a component of a normal diet by most people, but there are strict vegetarians who would argue that it is immoral to kill animals for food. Divorce was considered immoral by most people up until recently; now it is more commonly viewed as unfortunate but sometimes necessary. In most cases, it is the attitude of the majority that determines whether an issue is widely considered to be practical or moral. Our laws generally support the majority, but the opposite has also been true. Prohibition was passed when alcohol consumption was considered immoral by a powerful minority, but making liquor illegal did not change the attitude of the majority and the law was eventually overturned. The abortion issue is similar. A vocal minority is trying to make abortion illegal, but until they convince the majority that abortion is more a moral issue than a practical one, they will be unsuccessful. The difference between morality and practicality then becomes a matter of extent. If you believe a principle to be a moral imperative, that it is universal and applies to all, then it is not enough to follow that principle yourself or within your like-minded group; you must fight to ensure that everyone believes as you do. This provides some excellent insight into the thinking and actions of abortion opponents and other moral crusaders.